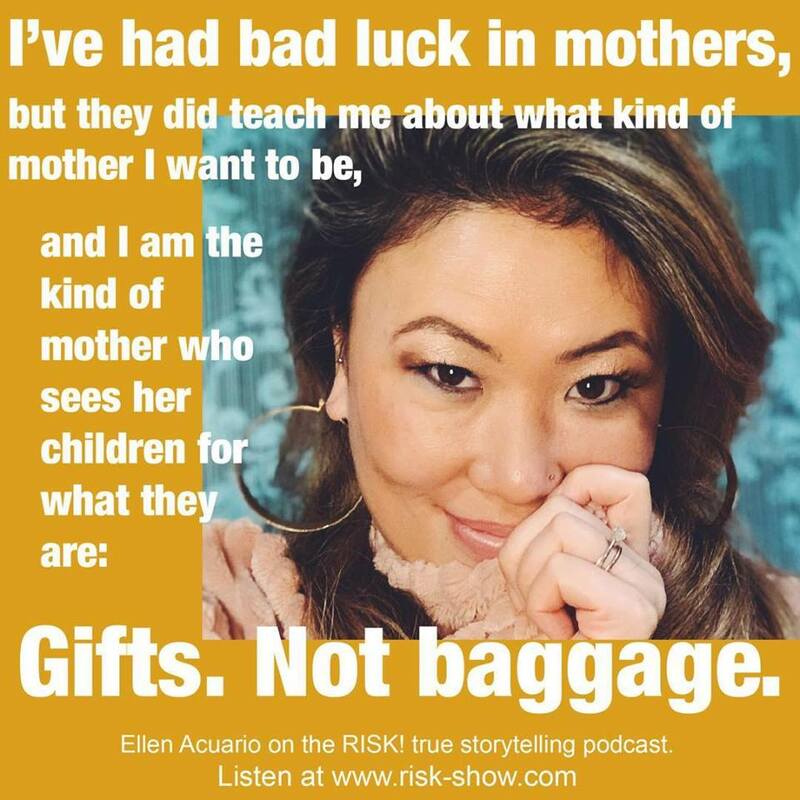 An addictive podcast created by The State alumni Kevin Allison, Risk! encourages both ordinary and famous people to tell their deepest secrets live on stage. There is virtually nothing that has not been done or covered by a podcast at this point — from cooking to serial killer exposes. Even Levar Burton’s Reading Rainbow got in on the act. However, there is one podcast that dares to go where it’s audience never thought they would go: telling stories they never thought they’d admit. 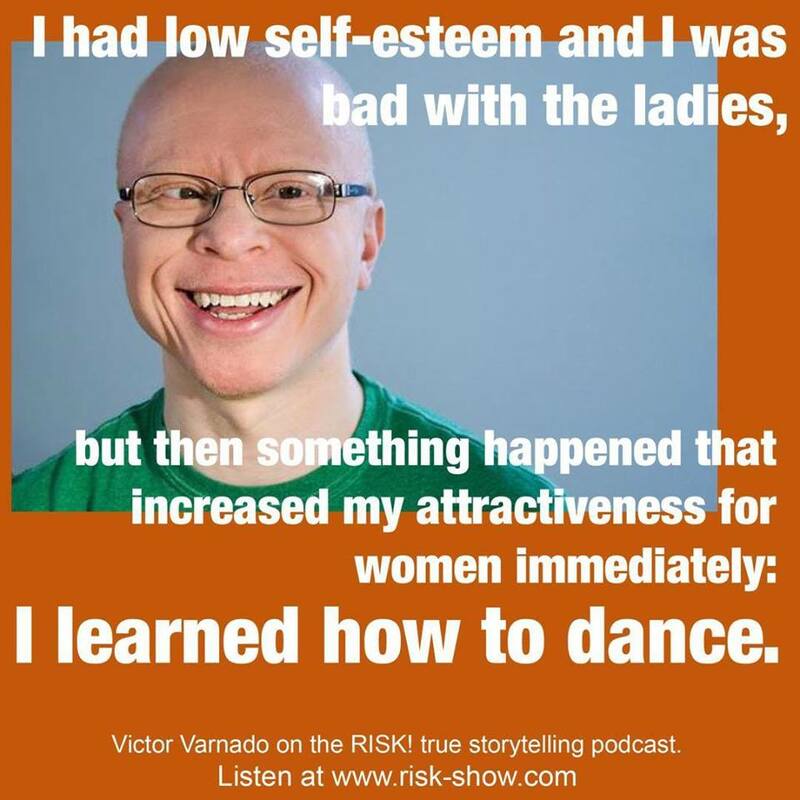 Created in 2009 by Kevin Allison, a founding member of sketch comedy troupe The State (he was “the redhead gay”), Risk! is a podcast that invites us bare it all to people we never met and will never see again. The idea for the podcast came when Allison decided to start by daring himself. Well, sort of. The story goes that Allison was doing a solo show on the west coast, after The State had ended. While doing a lot of character work during his show, fellow State alumnus Michael Ian Black suggested that he ditch the characters and just tell his own stories. Allison noted how he felt a kind of electricity with his audience, and how the story resonated with them. He found that being honest and raw with an audience elicited fascinating results that he couldn’t predict. He went home that night and immediately wanted to create a show called, well, Risk! Allison knew that he wanted to hear other people’s stories. It didn’t matter if they were hilarious, scary, boring, whatever. There was just something appealing to this idea of telling strangers things you once swore to take to your grave. The show has featured many people, from everyday people to popular comedians like Marc Maron, Margaret Cho, Sarah Silverman, and of course, fellow The State alumni such as Black and Thomas Lennon. Of all of the famous people that Allison has had on the show, his favorite has so far been the South African comedian and current host of The Daily Show, Trevor Noah. A pre-Daily Show Noah had met with Allison to go over the show and its format. He originally wanted to tell a story from his high school years, but his mind completely changed after hearing the stories of the others before him. Risk! has since become so popular that it has not only accumulated millions of downloads, but also spawned a live show, an ongoing tour, and a book filled with stories originally told on the podcast by various comedians and famous guests. If you ask Allison what his favorite version of Risk! is, though, he’s going to tell you to stick to the OG. They say that everyone has a story in them. If you’re wondering if you have a good story for the show, then honestly, you probably do. Most people would assume that the best stories come from the famous comedians and performers that make guest appearances on the show. However, in Allison’s experience, it’s usually the opposite. Part of what makes Risk! so addictive for listeners is that element of human emotion and vulnerability. A story could start out funny but end up leaving the storyteller in a mess of tears, or vice-versa, as a sob-fest ending in smiles and laughter. We live in strange, uncomfortable times where its hard to say hello to a stranger on the street, let alone tell 75 people about the time you were the only kid in fifth grade without a partner on field day. To have an arena where humans can earnestly connect with each other through shared experiences and empathy is equal parts fascinating and encouraging. It provides entertainment and lets us know that our favorite celebrities are indeed “just like us,” but it also reminds us for a small chunk of time that we really aren’t alone in this vast universe after all. Risk! comes to Richmond on April 12th at The Hof, located at 2818 W. Broad St. Tickets are on sale now starting at $20. For more information check out Risk!’s official website. Richmond loves a good party, so it only makes sense that NYE draws some of the year’s best special events in town. In light of that fact, we have compiled a listing of some of our favorite events happening to close out the year. Here you can get an idea of the goings on, and what each event has in store for you. Make sure and get your tickets ASAP, as many of them will sell out. Enjoy, and have a very Happy and Safe New Year! The Party Liberation Front’s Decemberween (Halloween in December on New Year’s Eve) is one of the biggest events in the city, and certainly the most artistic wild party around, with big art and big sound! 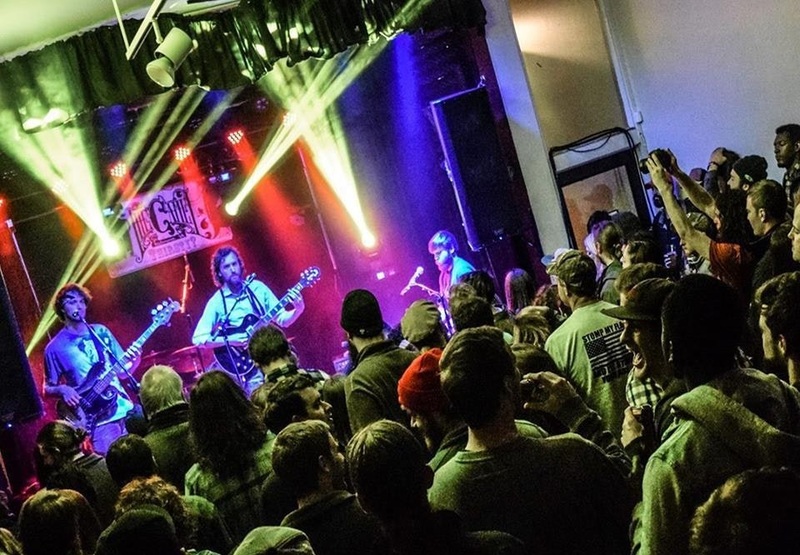 Decemberween 13 will be loaded with all the music, dancing, creativity, costumes, camaraderie, and community fun that you’ve come to expect — plus some new surprises in store for veteran attendees. 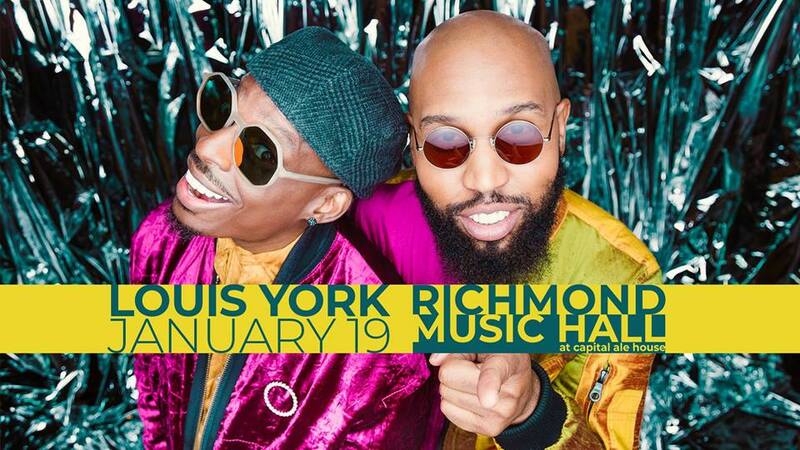 Diversity Richmond will again be hosting this one of a kind NYE event. We once again will transform the 10,000 square foot indoor event space and outdoor areas into multiple immersive environments for fire performance and music. 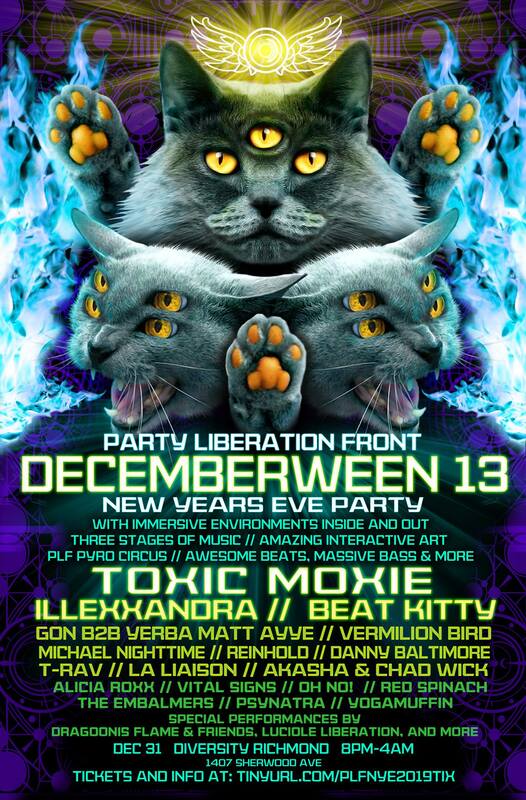 TOXIC MOXIE will be headlining a special NYE performance along with 18 DJs from all across the east coast. The event will also feature interactive art installations, circus arts, stage performances, outdoor pyro-sculptures, amazing fire spinners and fire troupes, art car showcases, live painting, champagne toast, and two bars with Hardywood Beer & Belle Isle Moonshine drinks! There are way too many things going on here to list, so check the event page — and GET THOSE TICKETS NOW BEFORE THEY SELL OUT!! 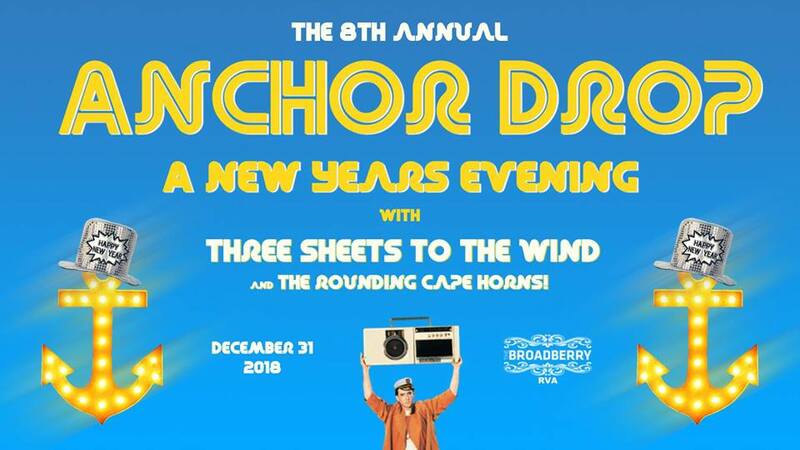 The best Yacht Rock band in the business, Three Sheets to the Wind, will help RVA ring in the New Year at The Broadberry. You know that they are going to pull out all the stops and drop the anchor in style for this special NYE Performance. The Rounding Cape Horns are coming too, with lots of our own local boys to provide the big brass sound. This is always a huge party, so get the tickets now. They have special VIP packages for those that want to score their own private penthouse on the boat before it sets sail. Get tickets here and click here for more info. 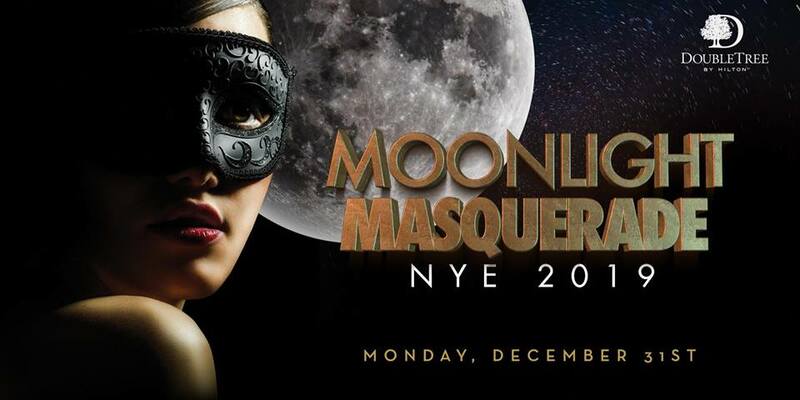 The Moonlight Masquerade New Year’s Eve Celebration at the Double Tree Hilton is another of the biggest events in Richmond, and well worth checking out. LX Group is bringing in multiple performers and an incredible lineup of DJ’s for a non-stop party into 2019. They are already at 500 people strong, so you want to get those tickets now before I go on any further. 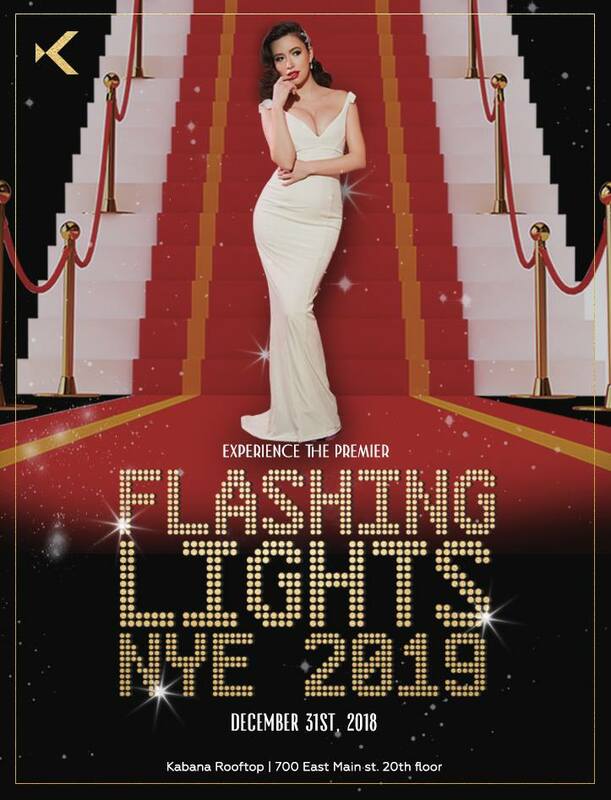 They have special couples tickets, along with appetizers and special drinks throughout the night, including a complimentary champagne toast. This is, of course, a masquerade ball — so get your fancy masks out for this one. Tickets can be purchased here, and for more info click here. If your looking for 80’s style hair metal, you got it right here with “The Here and Now” & “Teaze”. You will get all the glory of the 80’s sing alongs and wild party times. This one will include a balloon drop at midnight, with over $1000 in prizes. 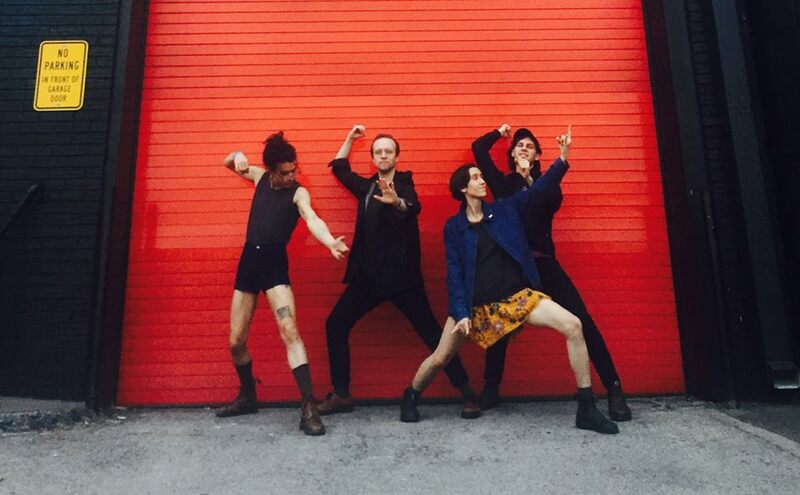 Having seen Teaze, I can promise you that they will crush it, and it will be a blast for all involved. So get your hair out (or Teaze your hair out, as the case may be), and stuff yourself into the spandex for this one. Click here for more info. 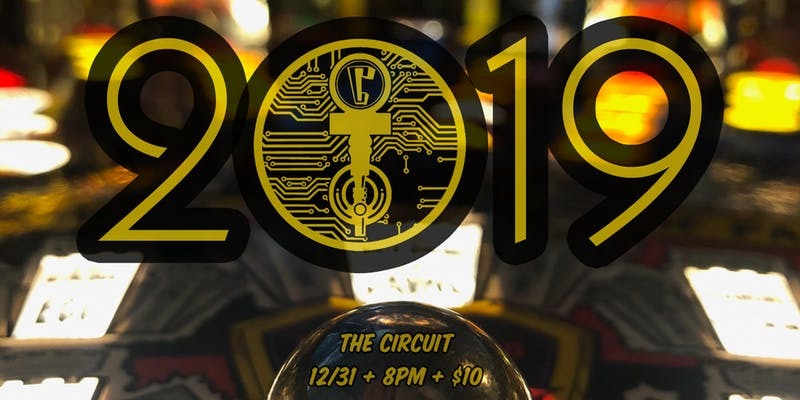 Join The Circuit, the arcade video game bar, for a very special NYE. 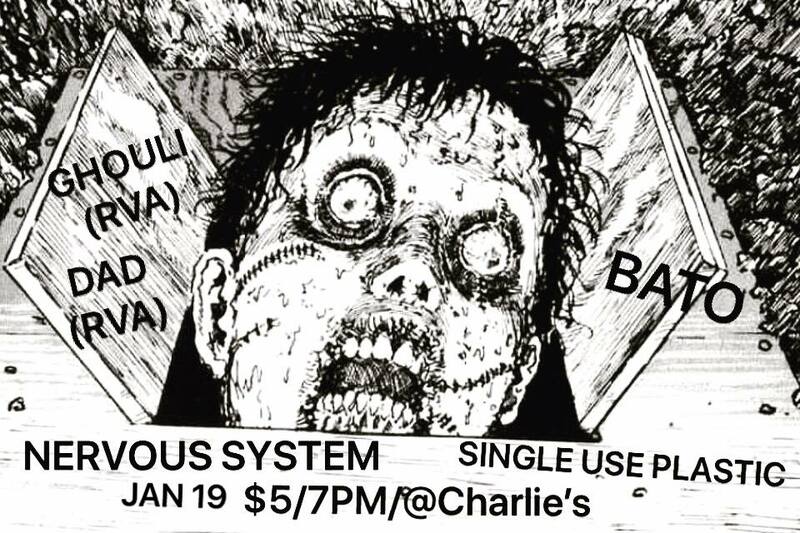 We are talking amazing brews all night along, with special video game-inspired music from F1NG3RS. They have complimentary snacks for you and all the games you can imagine to play. This is a great event for groups, featuring lots of things to get involved in. They also will have Gaucho food truck, with its delicious South American eats, to get your fill of delicious grub. This is a great NYE event if you just want to have fun, not worry about dressing up, just enjoy some drinks and games with friends. Grab tickets here, and click here for more info. 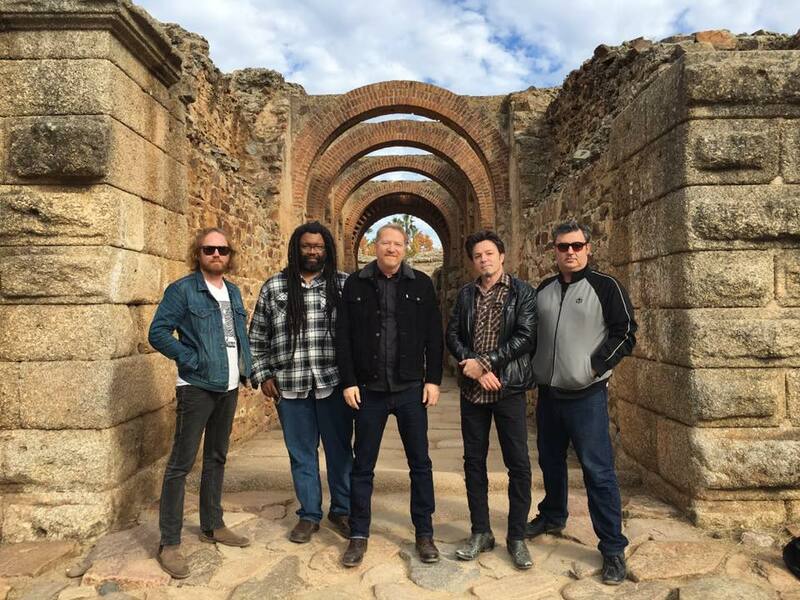 For those looking for some classic folk, country, bluegrass and Americana sounds on NYE, we have the Southern Belles and Jackass Flats ringing in the New Year at my favorite venue in the city: The Camel. 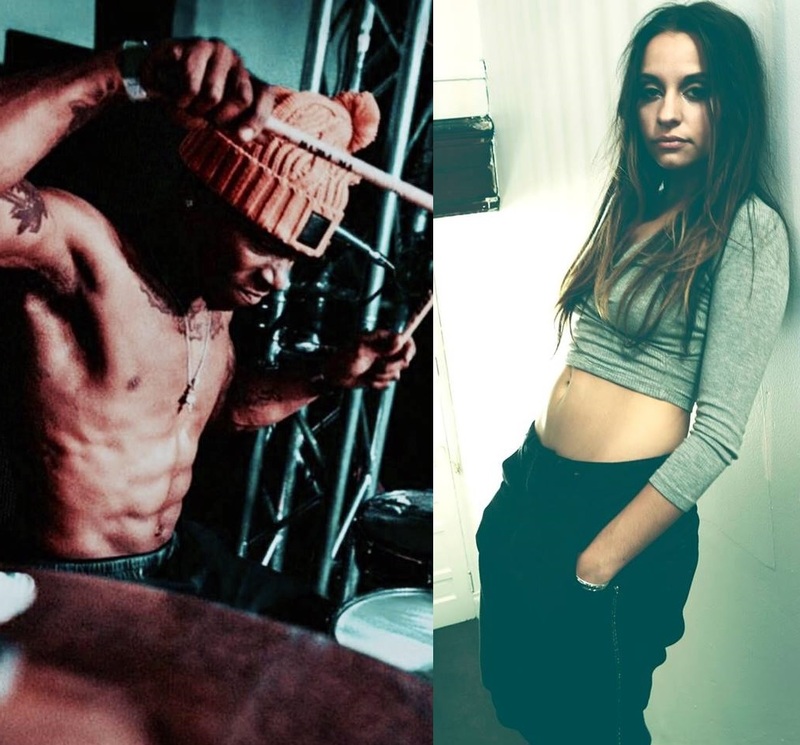 Both of these bands are so talented and fun, and on NYE you know there will be some special performances in store. Let the champagne flow, the booties shake, and the good times roll! Grab your tickets here, and go here for more info. 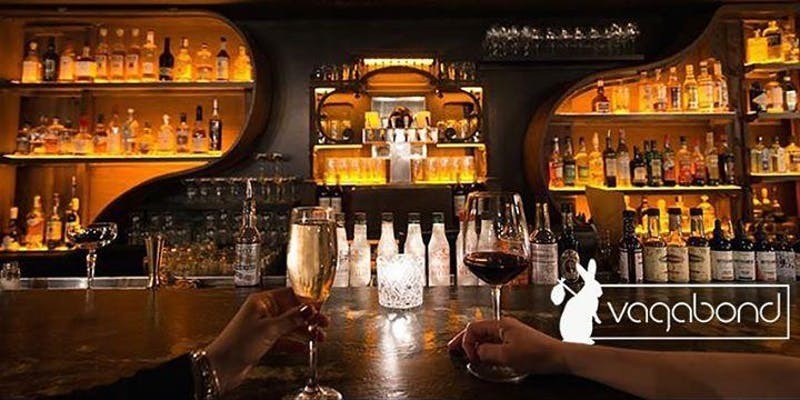 Vagabond will be quite a swanky party for you looking for the speakeasy bar in the basement with the sweet vibes. They have music by DJ King Cise, along with your host Juan Pierce. If you are not familiar with Vagabond, you should know that they know their drinks — we are taking classy drinks by talented bartenders. Ringing in NYE in the rabbit hole feels like that special invite to the bar at the end of the universe you just have to visit. Go here for tickets, and get more info here. It may be NYE 2019, but a lot of us would rather it be 1999. Looking to get your 90’s Fix on NYE? The Bayside Tigers deliver the 90’s hits to get you moving in all your neon glory. 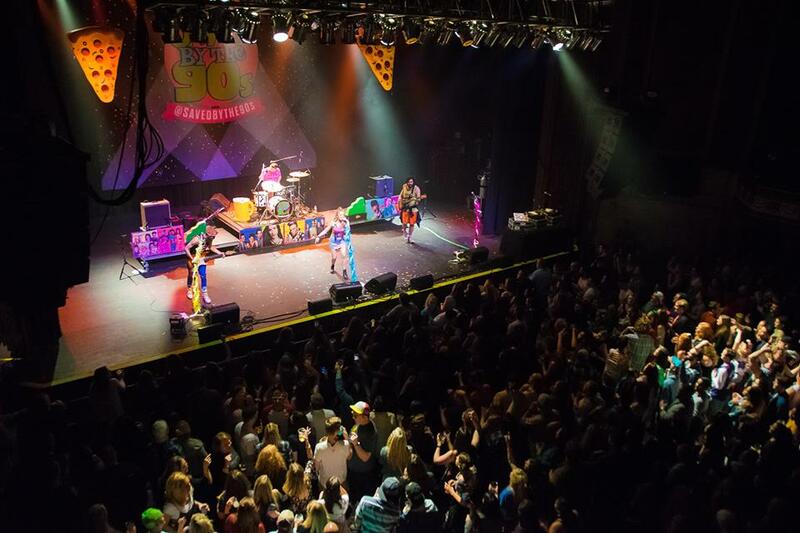 Saved by the 90’s is the premier 90’s party Holiday show that travels all over the US to bring the party to you. The party continues into the night with DJ GHOZT. It’s gonna be the raddest thing since Stacey’s Mom! Go here for tickets, and here for more info. Alert – Rooftop party on NYE overlooking the city! Kabana has invited Carlos Melange to ring the in the New Year from 20 stories up, and you should be there. Carlos is a NYC DJ and producer who is quite in demand these days, so you’re getting a certified crowd-pleaser here. Kabana of course will have a number of specials going on with hotel room specials, VIP sections, and party favors. This is a themed Red Carpet event, Hollywood-style, so get fancy, walk the carpet, and be treated like a star. Pick up your tickets here, and find more info here. And now for something completely different. 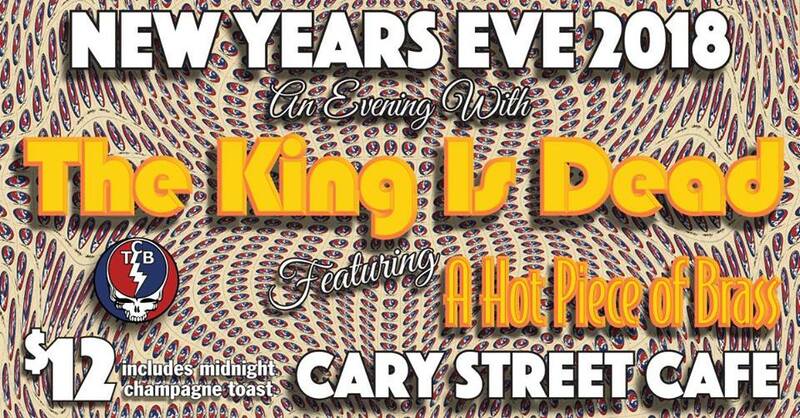 The King is Dead will bring you all the Grateful Dead and Elvis music you need in your life at Cary St. Cafe this NYE. 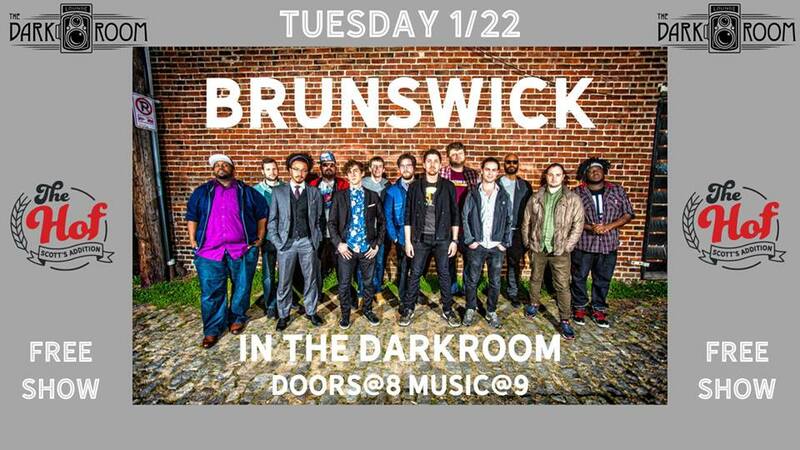 This is a night of amazing music and collaborations, along with the Hot Piece of Brass Horns as special guests. This is a night of funky music, champagne toast and countdown, and good old dead Elvis. 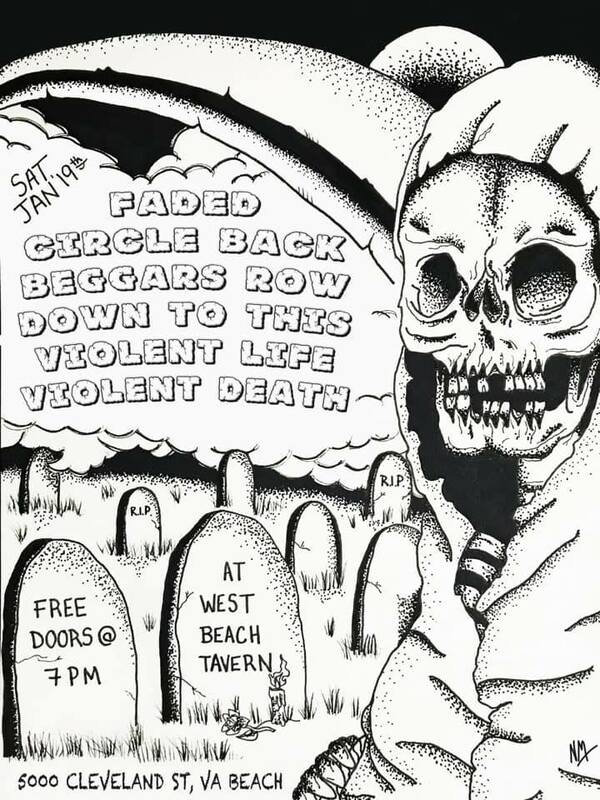 This is a no pre-sale event ($12 at door), so just show up and be ready to get down. For more info, you know where to go. NYE Live at the Hofheimer with P- Funk Allstars!! 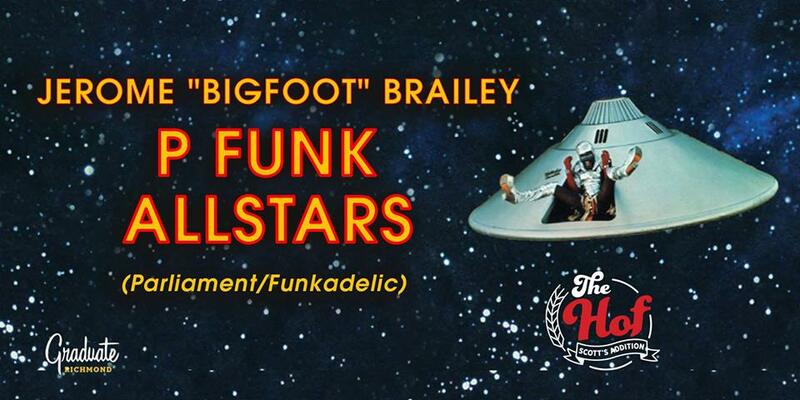 The Hof has something very special in store for NYE, with special guest Jerome “Bigfoot” Brailey from Parliament Funkadelic. This event is sure to be the funkiest party in town with this special performance, put together just for this event. They also have open bar from 8-10pm, with four fully stocked bars on multiple floors of this giant venue. You also get a balloon drop, party favors (hats, masks, etc), and multiple musicians and DJs in multiple rooms. They have upgrades and a special deal with Graduate Richmond to get you to and from the event to your swanky hotel room. Grab them tickets – Its gonna sell out, if it hasn’t by the time I wrote this (that was fast!). Tickets here, more info here. This evening, celebrate women with an art show at The HofGarden, a benefit event for Safe Harbor, a Henrico County-based nonprofit that serves survivors of human trafficking and sexual assault. The show centers around the theme of Intersectional Wonder Women, creating a space that stresses inclusivity and the diversity of experience and identity. The project is eight months in the making and began largely as a response to the 2016 election. It is a direct action for change, an effort that started small but grew into a project with an extensive team, more than 20 featured artists, and a long list of sponsors. Mallory said it’s a completely, 100 percent donated event. The community came together to put on the show without any prior funding. “I should say it surprised me, but it really didn’t. Everybody wanted to pitch in any way they could,” said Mallory. Among those who joined the project is Kortenay Gardiner, a community organizer for the Virginia Interfaith Center for Public Policy, who has become a key team member and chairperson of the show. 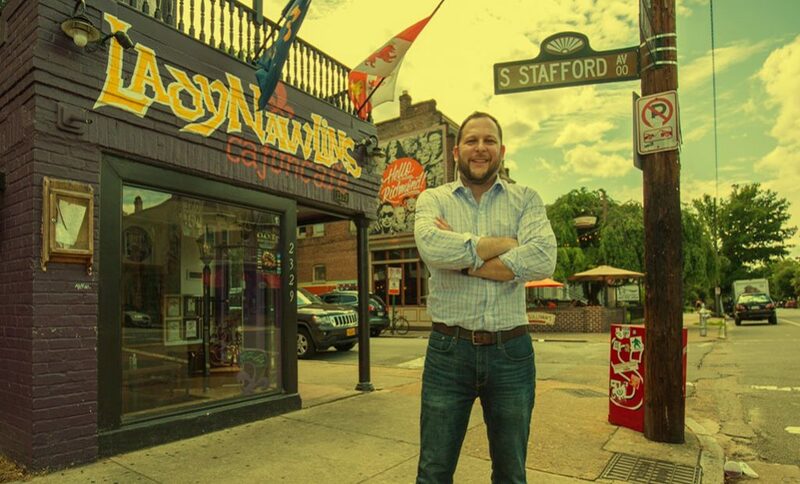 “It’s really important with where I work, with Safe Harbor, and even our theme, to envision a better world,” said Gardiner. I sat down with Mallory and Gardiner on the third floor of Richmond’s all-women coworking space, The Broad. Everything there is women made, created, and conceptualized—from the light fixtures to the art, to the books on shelves. Even the music playing over the speakers features all female artists. It’s a primer for the event to come, and though the space is modern and comfortable, with enough aesthetic appeal to be the “after” shot on a home renovation show, it’s a reminder of how few spaces exist exclusively for women. Mallory and Gardiner emphasize that this is not just a show to promote women, but to promote inclusive representation of all women, embracing a diversity of race, age, religion, and sexual orientation. That’s where intersectionality comes in. 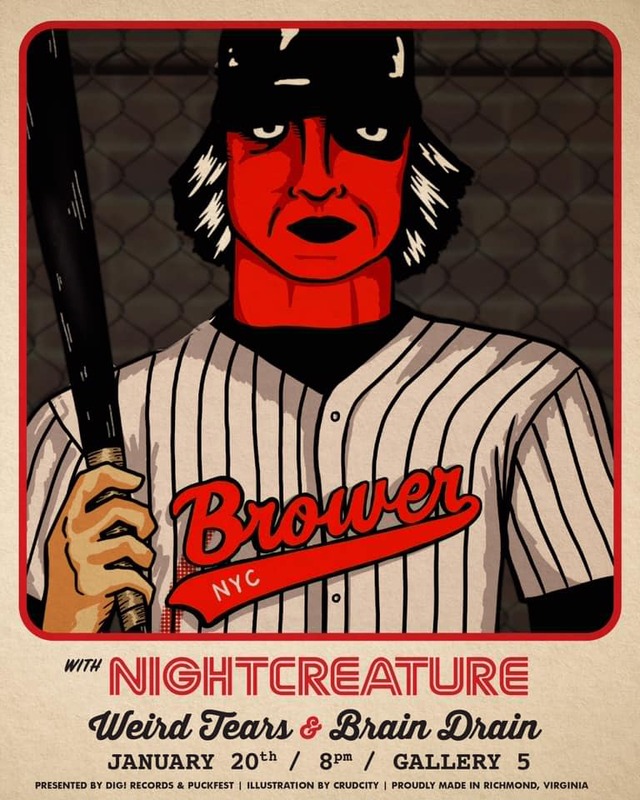 The HoF is donating their venue for the night, and each $10 ticket will go directly to Safe Harbor, while each art sale offers a 20 percent direct donation. There will be gift baskets available to win in a drawing that is comprised of almost $4,000 worth of donated goods and services from around the community. Richmond artist Virginia Strobach donated all of her services–including the illustration of the event poster–and her art, as well. Women-matter donated “Face Behind the Mask” for the drawing, a piece valued at $2,000 by Kraft Art. The art varies from $25 to $16,000. “There’s a nice range, and there’s accessibility to everything. The average price of work is about $250-300,” said Mallory. 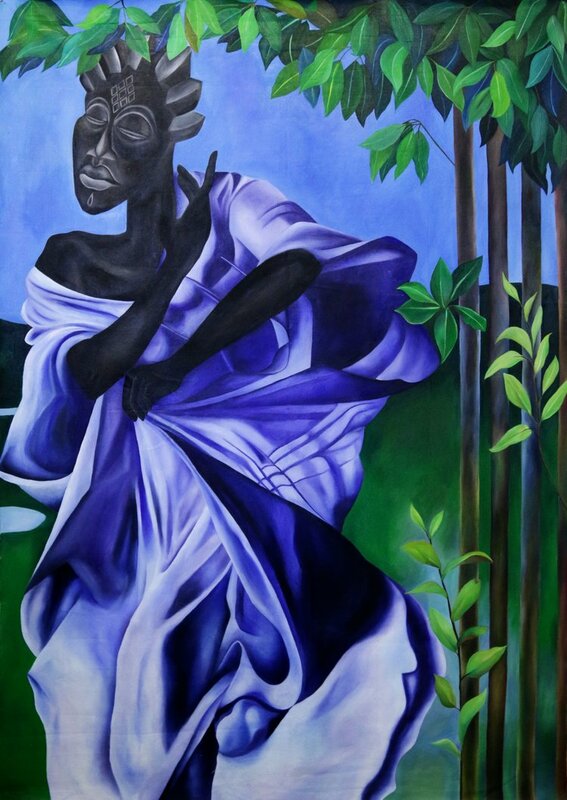 The work itself is diverse, ranging from multimedia, paintings, illustrations, ceramic work, and photography. “Every time I look at them, I fall in love with each one over, and over, and over,” said Mallory. Mary Maupai, development director at Safe Harbor, agreed that show starts an important conversation. Safe Harbor plays a huge role in deepening that dialogue in the community through advocacy, education, and support. “We provide everything from shelter, counseling, court advocacy, hospital accompaniment, children’s counseling, adult counseling, support groups, and…outreach and education in the community,” said Maupai. Box office hit Wonder Woman dropped in 2017 as the team was voting on the theme, and while the three of us agreed that we love the movie–it’s hard to resist an island of Amazons, after all–this art show exists to further the social narrative the film introduced. It’s not tied to any arbitrary hetero plotlines, lack of women, or racial erasure. 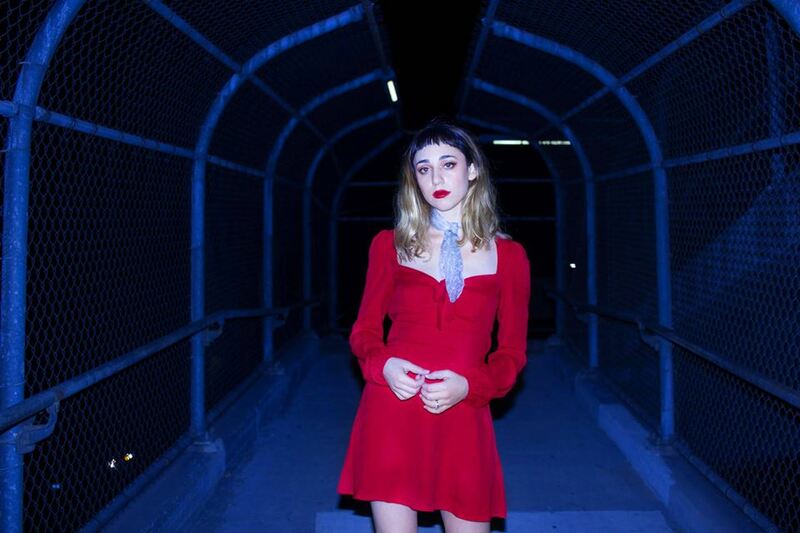 “The intersectional part of Wonder Women is reclaiming it,” said Mallory. The show is about a community of women, a community of people. Gardiner and Mallory say they have Intersectional Wonder Women to thank for their friendship. Maupai, who has been working closely with the team to plan the show, said the same thing: she wouldn’t have met these women, formed these connections and had these conversations any other way. “Hopefully some of those conversations will not only happen tomorrow night, but they will be carried home and will start a deeper dialogue about the way we perceive each other, how we treat each other, and honor in each other’s story and journey,” said Maupai. 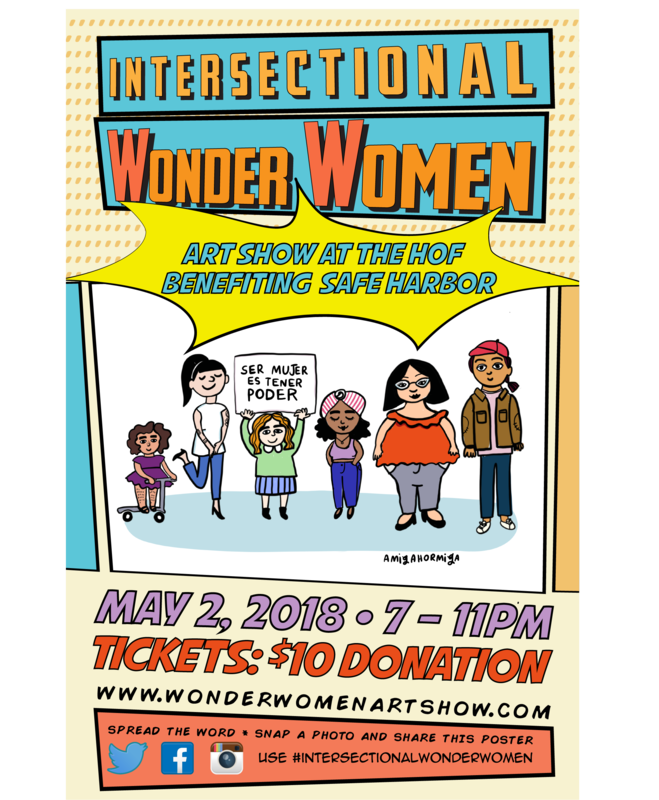 The Intersectional Wonder Women Art Show takes place tonight, May 2 from 7-11 pm at The HofGarden on West Broad Street. You can buy tickets here.